April 29, 2012 by Alphageek in "alphageek", "discovery"
Okay, we are hitting up coffee here again. Yes, I know, there is an incredible amount of information about coffee out there. There is a little spin today. Do you like interesting flavors like Almond Joy, or York Peppermint Patty? How about those Cinnabons that permeate the your nose, when you are walking around the shopping mall? Well, like them or not, we are going to review them because they have that interesting little niche that the alphageek likes. We want to thank Foodbeast for the inspiration here. You can read their announcement of these products at the following link. Maybe if we cite foodbeast, we can start getting some readers here! I was in Wegmans and I found a couple of the creamers there. While on vacation, I also found one more, so I decided to sit down, and share my thoughts with you. Creamers are an interesting contrast for a coffee drinker like the alphageek. Good coffee should not be covered up by other flavors, or even cream. Black coffee is the way to go. However, I find I am drawn to these flavors, when the last cup or two of coffee needs to be reheated. Once you reheat coffee, the taste goes downhill anyway, so why not punch up the flavors with some fun, in the form of a flavored creamer? After all, a little sugar and fat in one container is a great way to go. For this review, the creamer should evoke the thoughts of what the name says. If it says delicate roses, your coffee should taste like delicate roses, and not marigolds. Those little differences make a big difference to alphageek. 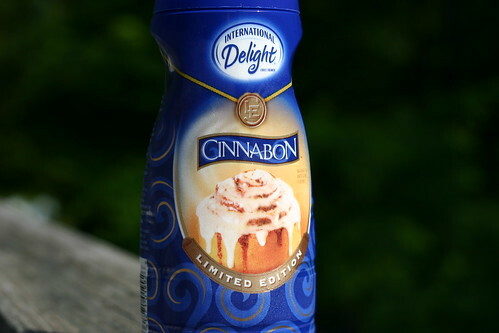 I am starting off with Cinnabon. I actually took a picture of Cinnabon. I added a little to my coffee and took a sip. All of the sudden, I had visions of walking around the mall, wondering where that darn booth is that always tries to get me to eat three giant buns, when I really only want one, and really should not eat any. Given that the flavor profile hit exactly, we rate this one as a definite buy. Moving along, we tried the York Peppermint Patty. It made the coffee taste just like a liquid York Peppermint Patty. The minty chocolate was just right, and we rate this one as a buy as well. Finally, we tried the Almond Joy. Unfortunately, this one just did not hit the flavor profile. The taste was just too generic. It could have been any sort of flavor in there, but it most certainly did not have that distinctive Almond Joy coconut flavor. The coconut flavor was barely there at all, making this one a pass. These flavors can be a fun addition to a cup of coffee, and certainly the Cinnabon and the York Peppermint Patty are worth a try. The Almond Joy is nothing special, so pass by it. Have you tried these creamers? Why not share some of your research with us? How about leaving a comment in the comment section below. Even better, why not use one of the links here on the page to follow us and all things food? The twitter feed gets everything at Follow @ageekfood , or you can try our facebook page.